Peter Hasselbacher of Münchsteinach: New Church Records. 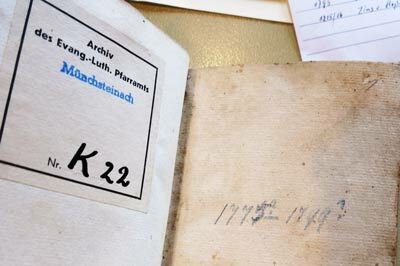 Earlier this summer I had the privilege of examining the actual church books in Münchsteinach which are housed even today in the Monastery Church for which the village is named. I have in hand photographs of church book records of baptisms, marriages, and deaths of virtually all the Hasselbachers who lived in Münchsteinach before 1800, and a few after that. Some of these were previously unknown to me. I will prepare and present these in the weeks ahead. However, church records can tell us of more than just these basic sacraments. They also document a variety of other religious and secular activities of the church. 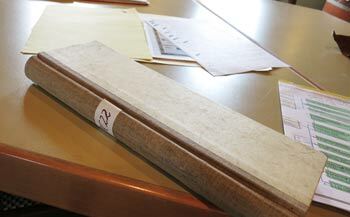 It is in non-sacramental records that our friend Konrad Zeilinger found records detailing the money paid to Peter's father Johann Georg, and his brother Balthasar for various repairs to the church. The historian Pfarrer Italo Bacigalupo found records of church fines paid by brother Balthasar Hasselbacher for his sexual dalliances. Often overlooked, but occasionally providing crucial information are the "minor" religious records such as confirmations and communions. These have been of great help to me before. We have a birth and baptism record for Peter from 1759 but, of course, no marriage or death record as he came to America when he was only 18 and never returned to Germany. With the full array of the church books of Münchsteinach before me, I looked first for the record of Peter's confirmation that would have taken place around 1773 when he was 14. Alas, the confirmation records for those specific years were said in the master index not to be present with the others. I therefore initially assumed that Peter’s confirmation record may have been either unrecorded or lost. However, I later noted that at least some confirmations in 1775, including Peter’s younger brother, Georg Conrad, were listed among the communicants. I may still be able to find Peter’s confirmation in a future visit. Meanwhile, the records of communicants proved very interesting. Even on first glance as I looked at the lists from 1775 through 1777, the names of our Hasselbacher relations jumped out at me, including that of my special cousin Peter. (The last entry of Peter's name that I could find appears in the heading of this article.) To summarize what I will present in greater detail below, I found that Peter was present in church several times in both 1775 and 1776. I believe that the last instance was at what I understand to be the Festival of the Assentation of Christ in 1776. This would have been about the 6th Sunday after Easter. I did not find his name again in the records, although the names of at least his brother Balthasar continued to be listed. Recall that Peter was already on the boat to America by March 1777. I will discuss the significance of these dates in relation to the question of where Peter was living when he was conscripted. It may well be indeed that Peter left Münchsteinach in the spring or summer of 1776 for parts unknown and ultimately to America! I was able to take photographs of some of the records before 1777 and analyze them further in the comfort of my home and with its resources. Unfortunately at the time I was with the original records, I had difficulty understanding what I was looking at. I did not have time to take photographs of the entire three-year sequence. Now that I better understand the church cycle of holy days, I will want to revisit the lists of communicants for continuity, to see if Helena Barbara remained in Münchsteinach, to look further for Peter’s other brothers, and look in earlier lists to see if Peter’s confirmation is included with communicants as Georg Conrad’s was and for earlier Hasselbachers. I do feel fairly confident that I would not have missed Peter’s name as I read through the lists because the handwriting was pretty good. List of Communicants: First Page. Next Page: Sample List of Communicants. Discussion of Significance of Findings. Back to Hazelbaker Home Page.